In a large mixing bowl, add marshmallow cream, white chocolate chips and peanut butters. Set aside. In a large saucepan, combine butter, sugar, salt, and whipping cream. Bring to a boil over medium high heat. Boil for 4 full minutes. Pour boiling mixture over ingredients in mixing bowl. Using an electric mixer, beat for about 1-2 minutes, until smooth and creamy (and white chocolate is completely melted). Pour half of the mixture into bottom of baking dish. Top with strawberry preserves. 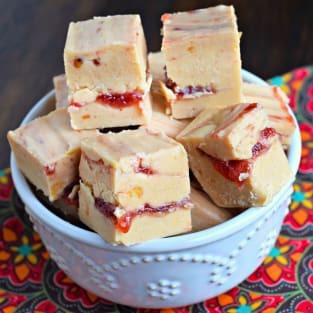 Using a knife, swirl the jelly into the fudge. Top with the remaining fudge mixture. Swirl again with the knife, to mix the preserves into the peanut butter layers. Refrigerate 4 hours, or overnight, until set. Cut into bites and enjoy. Store in airtight container in refrigerator for up to two weeks. ENJOY.